The abundance of Star Wars projects, both confirmed and unannounced, leads fans to theorize which filmmakers would be a good fit for the galaxy far, far away, with Mission: Impossible - Rogue Nation director Christopher McQuarrie's name often being tossed into the ring. Unfortunately, some negative interactions with the more angry corner of Star Wars fandom seemingly squashed the interest he had in directing a chapter in that franchise. On the anniversary of The Twilight Zone host Rod Serling's death, McQuarrie shared a tribute to the seminal sci-fi storyteller by praising the ways in which the host injected social commentary into the series' fantastical plots. One user replied to the filmmaker by claiming the "Social Justice Warrior" agenda should be removed from fiction, which inspired The Last Jedi writer/director Rian Johnson to chime in, resulting in a lengthy, and angry, exchange between a variety of users. McQuarrie went on to share with Johnson, "My friend, After five minutes of this, I don’t know why you’re still on Twitter. I would have loved to make a Star Wars film someday. I’m cured." Making matters even more frustrating is that the exchanges he shared with users have not only soured him on contributing to the Star Wars saga, but also to other established and beloved properties. When the filmmaker was asked if there was a superhero story he was interested in tackling, McQuarrie admitted, "Nah, after tonight I think I’m good." He added, "It saddens me, too. I consider myself first and foremost an entertainer. I work for the audience. Tonight I found people I could never work for." Earlier in the conversation, McQuarrie tried to opt out of the conversation entirely regarding social commentary and Last Jedi criticisms, with the filmmaker pleading, "I respect everyone’s right to be absurdly, passionately rude about something trivial that cannot be changed while the real world goes screaming to hell, but can I not be involved?" 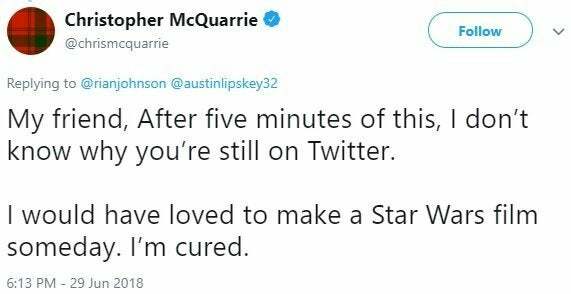 A fan then began to tell McQuarrie that dissenting opinions should be ignored and those users don't deserve to have their input considered, yet the filmmaker retorted, "Sure they do. That’s what democracy is all about. I just don’t have to work for them." The release of The Last Jedi has proven one of the more controversial moments in the history of Star Wars, with many fans embracing the new directions Johnson took the franchise, while others felt disappointed with those new character journeys. Even after sharing that he was no longer interested in directing a Star Wars film, McQuarrie continued to be subjected to anger from "fans" directed at Johnson and The Last Jedi, despite his requests to be left out of that conversation. Hopefully the future of the Star Wars fandom will redirect their anger into more positive encounters and reignite McQuarrie's interest in the franchise. McQuarrie's Mission: Impossible - Fallout hits theaters on July 27th. Would you like to have seen the filmmaker's vision of the saga? Let us know in the comments below or hit up @TheWolfman on Twitter to talk all things Star Wars and horror!